Filigree is essentially precast formwork in conjunction with traditional pour in place, with the advantage of adding void material to reduce loads and add insulation. Other benefits: no stripping of formwork, reduced shoring, and cost and time savings. The Filigree Wide-Slab System fire resistance testing confirmed its capability to sustain an over-four hour fire test, maintaining its full integrity and load capacity, without any signs of delamination. (See UL Test of the Filigree deck). 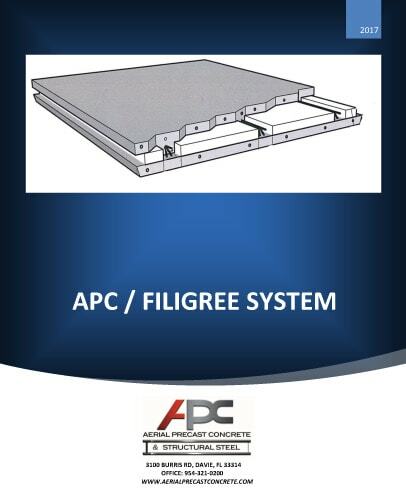 APC/ Filigree Eliminates Field Forming and Reduces Shoring Requirements. All work is done in a traditional manner, familiar to all trades. APC/ Filigree has great sound resistance for residential and institutional use. Filigree method of construction is less dependent on field labor and field labor productivity. It will substantially reduce the overall labor/material cost ratio. The final product is a combination of the most desirable properties inherent to poured in place and precast construction. In addition, Filigree Wide-Slabs are cast in polished steel molds, and will greatly enhance the appearance of any concrete structure. The system has fire resistance ratings up to 4 hours established through a full-scale fire resistance test at the Underwriter Laboratories. Efficient use of the APC/ Filigree method reduces cost of concrete structures. The prefabrication technology in APC/ Filigree reduces the need for field skilled and unskilled trades. Although all trades are represented, fewer are needed for each task with a reduction in payroll needs and enhanced cash flow. Filigree structures go up fast. High installation rates of up to 5,000 sqft. per day week can be achieved. Many trees are saved by the elimination of wood and plywood framing.